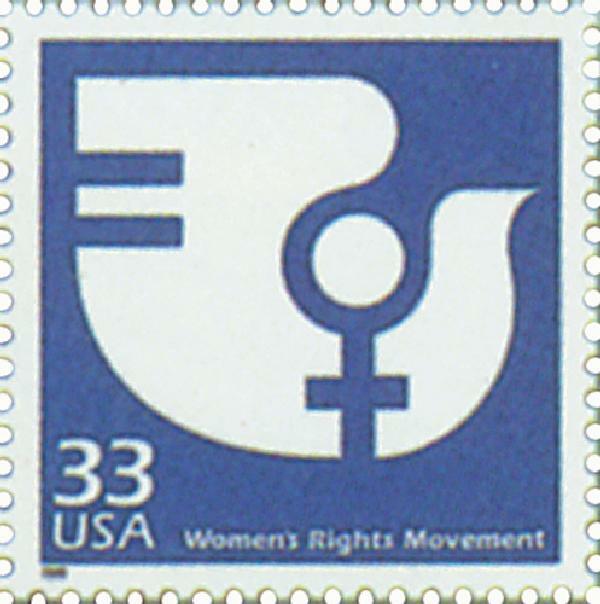 US #3130-31 were issued for the Pacific ’97 stamp show. 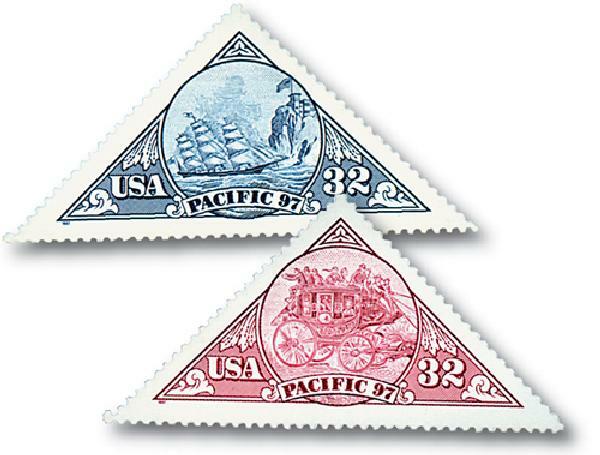 On March 13, 1997, the USPS issued its first triangle-shaped stamps to promote the upcoming Pacific ’97 Stamp Show. The world’s first triangle-shaped stamps came 144 years earlier. Issued in 1853, the British colony Cape of Good Hope’s very first stamps were triangle-shaped. They were reportedly created in that shape to help illiterate postal clerks easily identify letters that were mailed from within the colony from those that were mailed from other places. 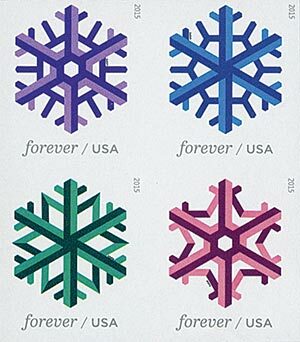 US #5031-34c – Imperforate geometric snowflakes stamps. On March 12, 1888, a short-lived blizzard mail service delivered letters to New York City during one of the worst storms in history. Just two days before, on March 10, temperatures in the northeast were in the mid-50s. But the next day, cold Arctic air from Canada met with Gulf air from the south sending temperatures plummeting. The rain quickly became snow and winds reached hurricane-strength – about 85 miles per hour in New York City. US #565 pictures Hollow Horn Bear, a Brule Sioux Indian chief. 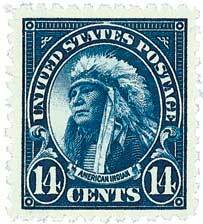 On March 11, 1824, US Secretary of War John C. Calhoun created the Bureau of Indian Affairs. Among the first acts of the new Continental Congress in 1775 was the creation of three departments of Indian affairs: northern, central, and southern. Benjamin Franklin and Patrick Henry served as some of the early commissioners of these departments, tasked with negotiating treaties with Native American tribes. Their goal was to establish tribal neutrality in the Revolutionary War. 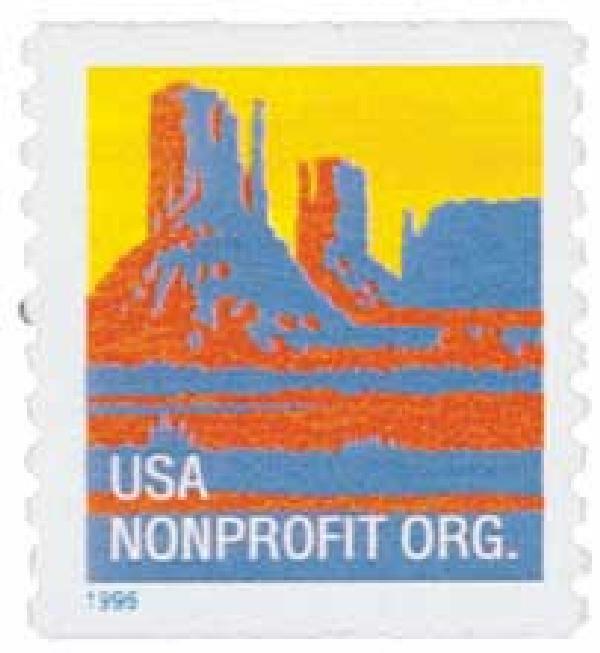 US #2902 was inspired by the East Mitten and West Mitten Buttes in Monument Valley. On March 10, 1995, the USPS issued the first stamps in two new definitive series – American Scenes and American Transportation (not to be confused with the Transportation Series). These two series, as well as the American Culture Series, were created for 1995 as part of the USPS process of converting its service-inscribed stamps for discounted bulk mail to non-denominational postage. 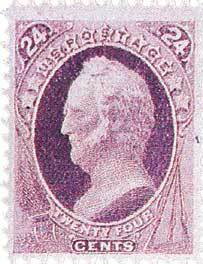 Bulk mailers could buy the appropriate stamps at a fixed price, affix them to their mail, and then pay the difference between the cost of the stamps and current postage when they mailed them out. This was done so that new stamps wouldn’t need to be created when rates changed. US #153 – National Bank Note Printing. On March 9, 1847, the US launched its first large-scale amphibious assault during the Siege of Veracruz. The battle was part of the Mexican-American War, which began in May 1846. The war largely stemmed from the US annexation of Texas and the Texan border. Major General Zachary Taylor led US forces in a string of victories at Palo Alto, Resaca de la Palma, and Monterrey. US #3189j – From the Celebrate the Century: 1970s sheet. On this day in 1914, International Women’s Day was first celebrated on March 8. One of the first known celebrations of a National Women’s Day was held on February 28, 1909, in New York. The event was organized by the Socialist Party of America at the request of suffragist Theresa Malkiel.